One of the motivating principles underlying the passage of the Affordable Care Act (ACA) was that comprehensive health care reform would substantially improve the federal fiscal outlook. But new research finds the ACA falls well short of that standard. Relative to previous law, the ACA both exacerbates projected federal deficits and increases an already unsustainable federal commitment to health care spending. In “The Fiscal Consequences of the Affordable Care Act,” Charles Blahous, Senior Research Fellow at the Mercatus Center at George Mason University and Public Trustee for Social Security and Medicare Trust Funds, examines the ACA’s various provisions to project the effects of the ACA on federal spending and deficits. The study also reviews possible legislative corrections needed to ensure the ACA does not severely worsen an already untenable federal fiscal outlook. Below is a brief summary. To read the study in its entirety and learn more about the author, please click here. Over the coming decade (2012-2021), the ACA is expected to increase net federal spending by more than $1.15 trillion, and to add more than $340 billion and as much as $530 billion to federal deficits over the same period, and increasing amounts thereafter. The ACA’s fiscal effects are often misunderstood because government scorekeeping conventions contrast with enacted law. The ACA relies upon substantial savings already required under previous law to maintain the solvency of the Medicare Hospital Insurance (HI) Trust Fund. These do not represent new net savings, available to be spent without widening the deficit, but substitutions for spending reductions that would have occurred by law in the absence of the ACA. These cost-savings provisions have the effect of extending and expanding Medicare’s future spending authority. The ACA also uses the same cost-savings to finance new health entitlement spending. The ACA’s total new spending thus well exceeds its cost-savings provisions. This is not a mere matter of presentational “double-counting” but of evaluating the actual change in law upon the ACA’s enactment. By law, as distinct from prevailing scoring conventions, the ACA has unambiguously worsened the federal government’s fiscal position. Moreover, several of the ACA’s provisions may not be enforced as currently specified. Among these, the costs of new health exchanges may be significantly higher than projected; the rising projected revenues of provisions such as the “Cadillac-plan” tax and the new 3.8-percent surcharge on incomes over $200,000/$250,000 may not fully materialize; the cost-saving recommendations of IPAB might be legislatively overridden; and the CLASS program—previously scored as saving $70-$86 billion over its first 10 years—is no longer expected to be implemented. To ensure the ACA does not worsen the federal fiscal outlook, fully two-thirds of the ACA’s new health-exchange subsidies must be repealed, or financing offsets must be found, before benefits begin in 2014. To ensure the ACA does not further increase federal health care financing commitments, the entirety of its new health exchange subsidies and most of its Medicaid/CHIP expansion must be eliminated, unless corrections reduce other spending by an equal amount. The ACA, signed into law on March 23, 2010, establishes a federal mandate that all individuals purchase health insurance, creates federally subsidized health insurance exchanges, expands eligibility for Medicaid, reduces the growth of Medicare payments, and imposes an array of new taxes. While expanded health coverage was a principal aim of the ACA, fiscal benefits were consistently presented as a primary justification for its passage. Throughout 2009, advocates urged that health care reform be given the highest priority among economic policy objectives because it was itself the essence of meaningful fiscal reform. Supporters and opponents disagreed on the optimal role of the federal government under a reformed health care system, but there was a general consensus that health care reform must significantly improve the fiscal outlook. There are two important yardsticks for measuring the fiscal effects of health care reform: 1) its effect on projected federal deficits, and 2) its effect on federal health care spending. Neither is sufficient by itself. Effective health care reform must both improve net federal finances and bend the health care cost curve downward. To display a realistic range of the ACAs fiscal effects, this study presents a set of alternative scenarios using methods analogous to those employed by the Congressional Budget Office (CBO) for income tax law. The optimistic scenario assumes all of the ACAs future cost-savings will be fully realized, including those that may become politically implausible. measures, though by less than has been done with several comparable processes in the past. A more pessimistic scenario shows the consequences of Congress ultimately acting to overturn certain savings provisions under the ACA in a manner relatively consistent with historical precedent. The ACAs fiscal effects are often misunderstood because of prevailing federal government scoring conventions. These conventions compare the effects of legislation to a hypothetical baseline that assumes all scheduled benefits of programs such as Social Security and Medicare HI are fully honored, even though the law requires benefits be cut upon depletion of these programs' trust funds. Under law, without the ACA provisions, one of two other things would have taken place: 1) the Medicare HI Trust Fund would have been depleted in 2016 or 2017 (depending on the particular estimate), thereby reducing benefit payments, or more likely, 2) lawmakers would have enacted other Medicare savings to avert trust fund depletion. Under the ACA, however, Medicare savings which extend the solvency of the Medicare HI trust fund and, thus, expand its future spending authority are also used to finance a new health care entitlement. The combination of these two effects exceeds the cost-saving measures in the legislation and worsens federal deficits relative to previous law. While the prevailing scorekeeping practice is useful for many policy evaluation purposes, it obscures the adverse fiscal effects of using Medicare savings to fund a new spending program, as under the ACA. This fiscal worsening exists both under law and as a matter of political economy. Historically, lawmakers are much less likely to address cost growth in Medicare and Social Security when these programs are deemed to be solvent. Whenever the solvency of these programs is further extended, the political imperative for cost reductions is diminished and more spending occurs as a result. The CLASS Program. Of the ACA’s $210-billion positive impact over 2012-21 in CBO’s 2011 estimate, $86 billion was attributed to a new federal entitlement providing insurance for long-term care, the Community Living Assistance Services and Support program (“CLASS”). From the start, the financial design of CLASS was widely criticized as fundamentally flawed. The Department of Health and Human Services has since announced it would “suspend work” on implementing CLASS because it could not be operated in an actuarially sound manner as required by an ACA provision. It is now assumed for budget scorekeeping purposes that CLASS will not be revived. Federally Subsidized Health Insurance Exchanges. The ACA establishes federal subsidies for lower-income individuals to buy health insurance in state-established exchanges. According to a 2011 CBO analysis, the exchange subsidies and related spending will total $777 billion from 2012-21, more than any other ACA provision. Program Expansion: the risk that lawmakers will expand the growth of these subsidies relative to projections under current law. With respect to participation rates, there is an ample body of literature with widely divergent projections for the degree of movement from employer-sponsored insurance (ESI) into the exchanges. The ACA’s health exchange subsidies are also highly susceptible to future legislated expansion. After 2018, a “fail safe” provision designed to constrain the subsidies’ total cost would likely cause them to grow less rapidly than beneficiaries’ health care costs, thus requiring low-income individuals in the exchanges to shoulder a steadily increasing percentage of their health costs. The exchanges would also create horizontal inequities between different individuals of similar income levels, which could lead to further pressure on Congress to expand eligibility criteria. Even the modest projection changes of substituting the Centers for Medicare & Medicaid Services (CMS) Medicare Actuary’s participation assumptions for CBO’s, and assuming subsidies grow in proportion to health care cost growth and 1-percent annual participation growth per year, adds more than $50 billion to the projected 10-year cost. Over the longer term, the potential for faster cost growth in the exchange subsidies threatens far more damaging fiscal effects. The Independent Payment Advisory Board (IPAB). This board, established under the ACA, would be charged with recommending reductions in Medicare payments sufficient to prevent overall program cost growth from exceeding a long-term rate of per-capita GDP plus 1 percent (with additional annual growth specifications in the near term). These recommendations would be implemented unless overridden in legislation. IPAB has two principal sources of financing risk: 1) substantial savings will be required of IPAB to meet the ACA’s Medicare growth targets; and 2) Congress could override these cost-savings or eliminate IPAB altogether. Medicaid/CHIP Expansion. The ACA would also significantly expand insurance coverage under Medicaid and the Children’s Health Insurance Program (CHIP). Aside from the new health insurance exchanges, the cost of this expansion is the ACA’s single biggest line item. CBO’s March 2011 estimate finds the expansion would add $627 billion in new direct spending from 2012-21. ACA cost projections are sensitive to estimates of new beneficiaries in Medicaid and CHIP: the greater the expanded participation, the greater the spending under those provisions. It is reasonably likely, however, that if Medicaid participation exceeded expectations, the cost of the ACA’s health exchanges would be reduced relative to current projections. The “Cadillac-Plan” Tax. Starting in 2018, this provision would impose a 40-percent excise tax on insurance plans with an annual value of greater than $10,200 for an individual and $27,500 for a family. For 2019, these thresholds would be indexed to general price (CPI-U) inflation plus 1 percent, but from 2020 on they would be indexed to inflation only. Because, historically, health insurance costs have generally risen substantially faster than general inflation, under current projections a progressively greater proportion of employer-provided health plans would be subject to the excise tax over time. Of all of the ACA’s provisions, the Cadillac-plan tax in its current-law form is perhaps the one that most warrants skepticism. It did not survive its initial clash with political pressures. The form of the tax enacted with the ACA was almost simultaneously amended to both postpone the tax’s effective date and increase the thresholds below which the tax would not apply. To assume the tax will produce the amount of future revenue now projected is to assume political actors in the future will be far more committed to this tax than the ACA’s original authors. The 3.8-Percent “Unearned Income Medicare Contribution” (UIMC). The ACA would apply a new 3.8-percent tax to the investment income of individuals with income exceeding $200,000 and couples with income over $250,000. Like the alternative minimum tax (AMT), income thresholds for triggering this tax would not be indexed and, thus, would capture an increasing number of taxpayers over time. But, as often occurs with the AMT, Congress may periodically modify the UIMC’s income threshold to avoid a sudden upward spike in the number of taxpayers subjected to it, resulting in less revenue than under current projections. 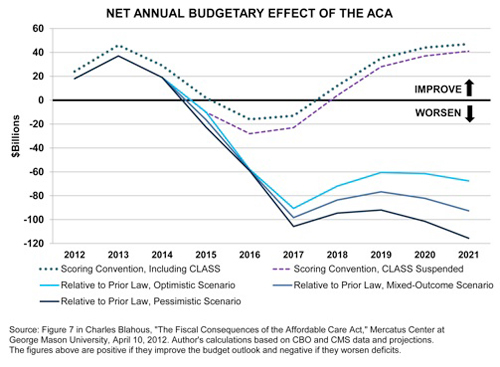 Relative to prior law, the ACA would increase an already unsustainable federal commitment to health care spending, exacerbate projected federal deficits, and thus considerably worsen the federal fiscal outlook. This is an unambiguous conclusion, regardless of the degree to which the law’s various cost-saving provisions are upheld. It portends a disastrous outcome for federal finances in the absence of prompt legislative corrections. To ensure the ACA does not worsen the federal fiscal outlook, fully two-thirds of its new health exchange subsidies would need to be repealed before benefits begin in 2014. Moreover, to ensure the ACA does not further increase federal health care financing commitments, the entirety of the new health subsidies and most of the ACA’s Medicaid/CHIP expansion must be eliminated. Alternatively, other cost reductions must be enacted to offset the new commitments made under the ACA. The findings of this study are based on analyses of the CBO and CMS Medicare Actuary published before late 2011 when the study entered its final review. While CBO has since published updated projections for some of the fiscal effects of the ACA, the qualitative findings of the study regarding federal finances are likely to be essentially unchanged in view of updated information.